Al Taawon goalkeeper and Egypt international Essam El-Hadary has revealed that he is meeting Juventus and Italy goalkeeper Gianluigi Buffon next month. El-Hadary is set to break a record in this summer’s World Cup in Russia as the Al Taawon skipper could become the oldest player in history to play in a World Cup tournament. 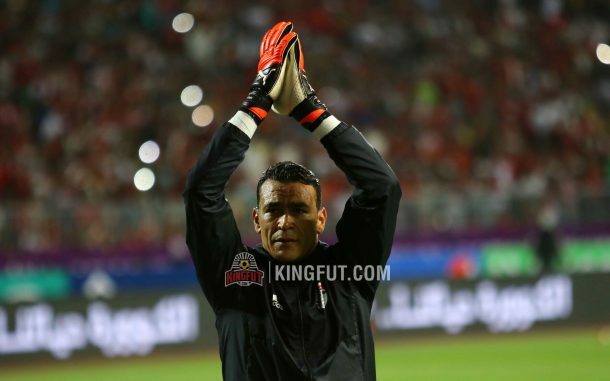 The former Al Ahly and Zamalek keeper, has played 154 matches for Egypt, and is set to become the oldest player to play in the World Cup aged 45, overtaking Colombia’s Faryd Mondragón, who was 43 during the 2014 World Cup. Speaking to MBC Sports program Action Ya Dawry, El-Hadary revealed his admiration for the Italian goalkeeper, saying: “I consider Buffon as my idol in football. “I met him in the 2009 FIFA Confederations Cup when Egypt played against Italy. Surprisingly, he asked for my shirt after that game,” he added. It’s worth mentioning that Egypt will be part of this year’s World Cup, whereas Italy failed to book their ticket to Russia as they failed to qualify. “I am meeting with Buffon and his private goalkeeping coach in April and it will take place in Italy” he concluded. Egypt were drawn in group B alongside Uruguay, Saudi Arabia and hosts Russia. Their opening game will be against Uruguay on June 15. Then they will face Russia on June 19 and will end their group stage campaign by facing Saudi Arabia on June 25.